I was looking to add more than 200 users to one of my WordPress websites over the weekend. I wanted each to have a login, password and display name as I wanted each to have the ability to post to the website. The thought of having to add each one individually was a bit overwhelming. Before I started manually punching them all in I checked out the plugin directory to see if there was a solution out there. 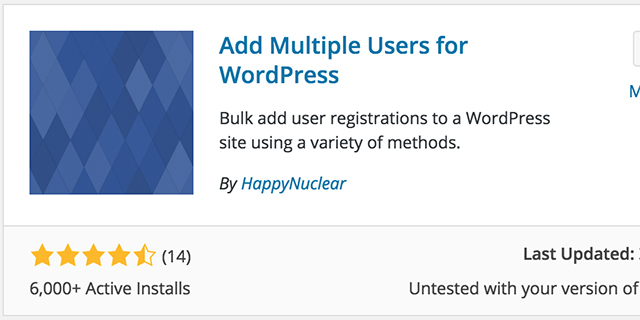 The plugin I found and used is called “Add Multiple Users.” I did my research and saw that the plugin hadn’t been updated in a couple years, but I gave it a go anyway — and it worked like a charm. I basically created a spreadsheet in Excel with the 6 columns with information I wanted to import. After filling all the columns in with data I saved the file as a .csv and then imported it into the AMU plugin. It worked seamlessly and an I-Can’t-Imagine-How-Many-Hour job was cut down into a 30-minute production. This plugin would be a great addition for staffs at the beginning of the year as they work to add new staffers to their websites. The plugin even allows you to select the user access level for those individuals you are importing. While you won’t use this plugin much, it’s a great one to add to your shortlist for site management.